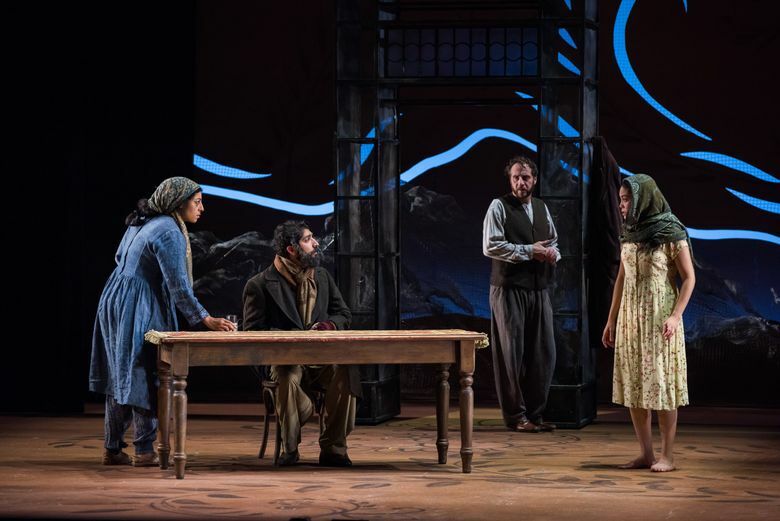 Despite its roots in real-world suffering, this adaptation of Khaled Hosseini's best-selling novel feels strangely uncomplicated, and uncomfortably pat. Some plays make us squirm with their unnerving subject matter (brutality, toxicity, emotional mayhem). Some plays make us squirm simply because they’re crap (often a ham-fisted treatment of said delicate subject matter). But sometimes, the squirmiest thing about a play isn’t the play itself, but how the audience reacts to it. 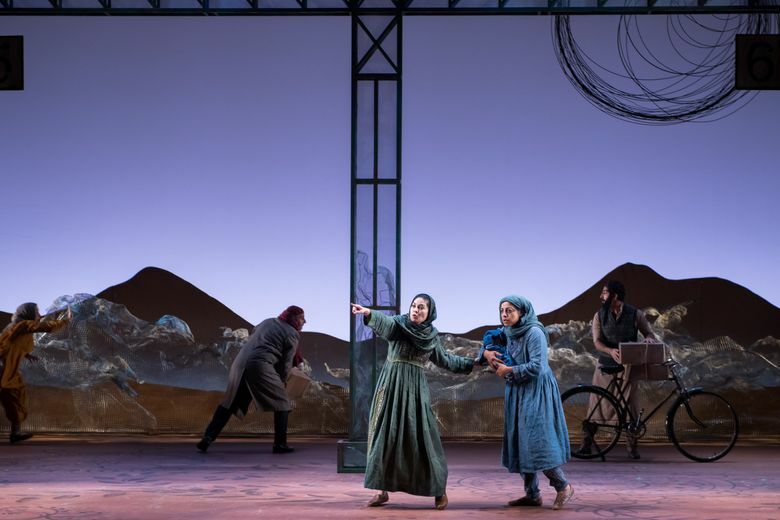 Take the opening-night crowd at “A Thousand Splendid Suns,” a long, dismal tale (based on the 2007 best-selling novel by Khaled Hosseini, adapted for the stage by Ursula Rani Sarma) concerning the almost unremitting suffering of two heroines in Kabul at the turn of the 21st century. That night, the audience seemed almost too eager to congratulate itself on being above and beyond the play’s brutish men and suffering women. But first, a quick sketch of the play itself. 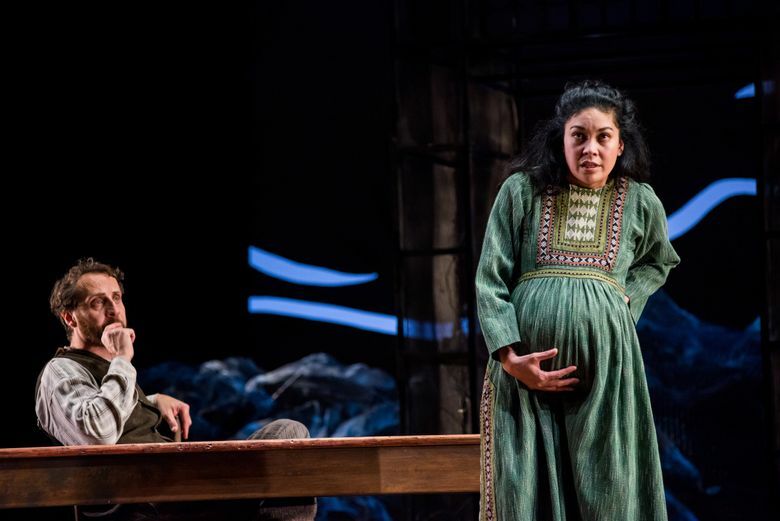 The play’s political backdrop is chaotic, but it comes packaged in the two-dimensional quality of a fairy tale where men are born to inflict suffering and women are born to endure it. (As one dead character intones her daughter from beyond the grave: “There is only one skill a woman like you and me needs in life, and they don’t teach it in school … tahamul. Endure.”) Some characters are born, some die, but almost nobody changes. Laila (Rinabeth Apostol) is a carefree girl until a bomb hits her house, killing her family. A neighbor named Rasheed (Haysam Kadri) scoops her up from the rubble, takes her home and promptly marries her as a second wife in his domestically violent household. The first wife, Mariam (Denmo Ibrahim, who brings the cast’s only real emotional gristle), resents Laila at first — but they eventually form an alliance over their nonstop cavalcade of horrors: brutish husband, brutish cops, beatings, starvings, sexual assault, failed attempts to escape, a cesarean section without anesthetic, and on and on. “Suns” is a brutal but fairly simple story, so the opening-night audience knew exactly when to tut-tut. Rasheed sells Mariam’s wedding ring to buy a new one for his young new bride? Gasps. Mariam stares into the middle distance of the audience to say the Taliban have “declared war on women”? Thoughtful “mm-hmms” all around. One woman kills a misogynist with a blunt-force instrument? Applause and squeaky cheers of delight. When Kadri took his curtain call for the role of Rasheed, he caught some boos — not, presumably, because he’s a bad actor (he isn’t) but because his character is an out-and-out ogre. The memo from the audience seemed clear: Gosh, it’s terrible over there. Thank god we’re more enlightened. It feels good to sit in the dark and cheer in solidarity with those poor, oppressed women. From one point of view, that’s fine. It’s everyone’s prerogative to write binary, good-and-evil morality plays where the baddies are bad (Rasheed never shows a second of remorse or hesitation), our long-suffering heroines remain long-suffering heroines (Laila’s only steps toward anything like transgression are brave acts of disobedience) and the audience gets the quick catharsis of cheering or booing on cue. But Hosseini, who was born in Kabul but moved to France and then the U.S. as a child, has spent a career trying to give the people of Afghanistan faces and backstories. 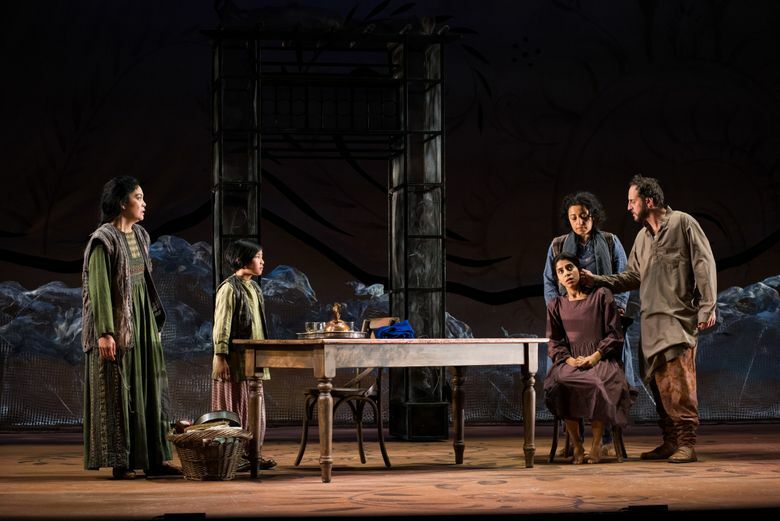 For all its objective horrors, this adaptation of “Suns” — first commissioned by American Conservatory Theater in San Francisco and directed by its longtime leader Carey Perloff, who stepped down in June — goes down a little too easy for comfort. Which is not to say “Suns” doesn’t have a few flickering rewards. Ibrahim, as Mariam, brings a richly textured, grounded, world-weary humanity to her role. Around 20 minutes in, she gives the production its best gesture. Once Rasheed has congratulated himself for saving the neighbor child Laila, Mariam sniffs out his plan to marry her — and risks defying him. “I won’t allow it,” Mariam says with tentative boldness (like a moment she’s trying out loud for the first time after rehearsing it in her head for years), then flinches, stiffening the shoulder closest to Rasheed. The live score is equally evocative. Off in a corner, seated just to the side of the front row, composer David Coulter (who has worked with big shots like Yoko Ono, Robert Wilson and The Pogues) casts little spells of sonic tension with musical saw, brushes against a metal slab, electric violin, a chirpy wood bird caller and whatever else he pulls from his shadowy zone. But these glimpses of nuance are all too rare in this “Suns” which, despite its roots in real-world suffering, feels strangely uncomplicated, and uncomfortably pat. You probably won’t be surprised to learn it concludes in a hastily — but prettily — tied bow. Is it wrong to be suspicious of gruesome stories with happy, deus-ex-machina endings? The audience, which quickly leapt to a standing ovation, didn’t seem to mind. “A Thousand Splendid Suns” by Ursula Rani Sarma, based on the novel by Khaled Hosseini. Through Nov. 10; Seattle Repertory Theatre, 155 Mercer St, Seattle; $17-$87; 206-443-2222, seattlerep.org.